When making bundt cakes, you'll often find that you have too much cake mix as the tins vary in size, even when they are the same diameter. This is because of the depth and design. As a general rule of thumb, you should only fill your tin about three quarters full. So what do you do with the rest? Mini bundts of course! I bought these beautiful mini moulds from Thyme Deli for a bargainous price of £1.50 each. They are the perfect size and make really pretty little cakes. I used leftover Banana Bundt mix for these. I just filled then 3/4 full and popped them in the oven until they were golden brown on top. This particular size took about 35 minutes, but just pop a skewer in the centre to be sure. It should come out clean. 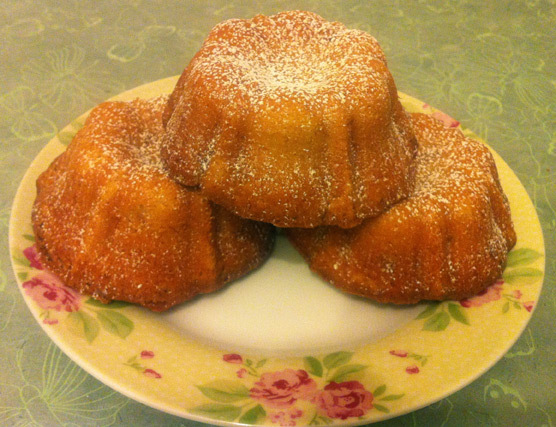 I love mini bundts - I have a special mini bundt tin which I love. I have some others which I haven't tried yet. Might be my new thing! Pretty cakes and a pretty plate too.